As we tweeted on New Years’ Day, the CLASS Act is officially no longer a law. The CLASS ACt was a Ted Kennedy initiative that made its way into the Affordable Care Act back in 2010. 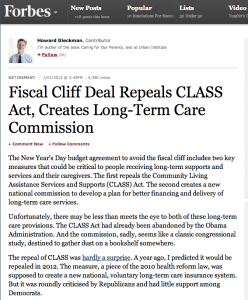 Forbes reports that CLASS Act was officially killed as part of the Fiscal Cliff deal. What does this mean for the average Joe? Not much, really. The CLASS Act was dead on arrival when it was made part of the ACA. The only reason why it was included in the bill was to make the cost numbers generated by the CBO more favorable. Basically, the CLASS Act was a tool in the sales kit for the Affordable Care Act. Like ObamaCare or not, it was more expensive than it was billed to be right out of the gate because of false inclusions like the CLASS Act. If Long Term Care Insurance was on your New Years Resolution List, you just lost one reason to keep procrastinating.